You never regret going on a bike ride. This is what I told my wife when I got home from the post office and bank today in a light drizzle and a recent drop in temperature. And this is true about my recent bike tour as well. My friend Richard called me today to check in on the recent tour and I realized that I had only blogged about the first two days. Assuming you all check my website daily I’m guessing you were quite certain and I had met an untimely end on a back road of Minnesota. It seems the only plausible explanation for why I hadn’t blogged day 3,4, and 5. As it turns out I did not die but am very much alive. I just got kind of tired. I’ve now written up the last few days and will post them one day at a time complete with an insight/observation blog at the end. Here goes something. The ride from from Wabasha to Winona was short and beautiful. It would’ve been shorter had I not got another flat tire. Again it was on the rear wheel which is akin to taking everything out of the trunk of your car to get to the spare. Luckily I got it right next too a beautiful park. I think it was in Goodview. So I had a snack, laid down on a park bench for awhile, and patched it up. Onward to Winona. I got to the Acoustic Cafe mid afternoon and stashed my stuff in a corner. I took care of work stuff- wrote a set list, deposited a couple checks at the bank, and sent off a CD order that I had been carrying with me since St. Paul. Then I headed over to Adventure Cycle & Ski and looked into some tire options. The folks there were great and I spent everything I had made in tips so far on a new tire (hard case, puncture resistant) and leg warmers. For some dumb reason I had only brought bike shorts and these nifty things covered the rest of my legs which I was very grateful for the next two days. I ate a huge vegi burrito. I played to a small crowd. Patty, who I sold my lap steel to a couple of weeks ago in St. Paul, happened to be playing with Jack Klatt down the street, saw me, and waved. We talked. Small world. The guys working at Acoustic were super great. People came and went as is the norm for most coffee shop gigs, but everyone that came listened. The tips were good, I sold a few CD’s, and at the end of the night I got to stay with a friend’s parents who put my bike on their bike rack and took great care of me. I woke up to french toast and eggs. ’nuff said. Yesterday was my longest ride in probably a year. 60 miles from River Falls WI to Wabasha MN. 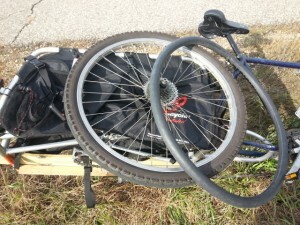 It took just over 6 hours including a lunch stop, a 5-10 minute break every hourish, and changing a flat tire. So I’m guessing I’m going 10-12mph, which is right where I was hoping to be on these travels. I’m really happy with how this is going. The morning was cold – it took about 10 minutes of holding a coffee mug at the diner I ate lunch at before I could successfully navigate my phone – but the afternoon was just about perfect. Today looks to be the same. There were some long slow climbs and some great descents and plenty of curves to keep you guessing what was around the bend. The shoulders were wide and smooth. At one point there was road construction that reduced the road down to one lane with a stoplight saying when you’re side could go. I wasn’t as fast as a car getting through that so the other side’s light turned green before I got out. So that was exciting. As much for me as the driver of the Silverado. But he survived. 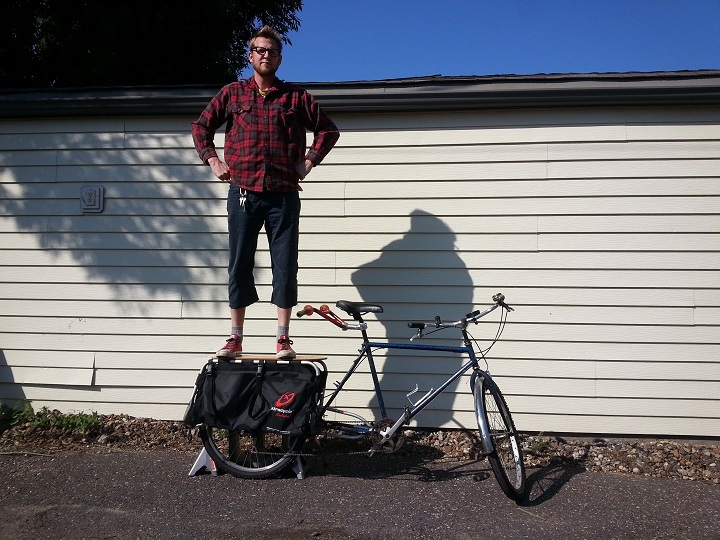 Last night’s concert was great – warm and receptive audience, lots of great conversations about the bike and what not. I left the bike at the church and got a ride with the couple I’m staying with and am once again at the receiving end of hospitality. 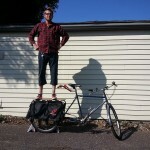 Once my riding clothes are dry I’ll be heading out to Winona. I’m grateful for safe travel and a shorter ride today. And I gotta admit, I can’t wait to get back on my bike. Thanks for all the kind words/wishes/prayers/tweets/comments/shares/loves/etc… See down the road! Nate. Yesterday was the ride from St. Paul to River Falls – went great, a little chilly, a little busy around some of the 94/694 entrance exit ramps, but that only inspired faster riding. Arrived at UWRF at 10:30 played/chatted from 11-1 met great people, ate free food, got put up in a hotel (ROCKANDROLL!) took a shower and a nap, hung out with my friend Erik, gave him a ride with my gear to Dish and the Spoon, checked out their wood fire pizza oven, was stoked to see some old friends and a huge group from Rush River Lutheran Church show up – Awesome! The bank sign says 42. I’m putting on gloves and heading to Wabasha – send all your friends down to Faith Lutheran tonight, por favor! In 8 hrs I hit the road for the first of five days of me and a bike and a guitar and a yous. My last post touched on picking a bike, this post is about packing for five days of touring on a bike. Before I post the video I must say thank you to all the positive feedback and posts and tweets and retweets I’ve been getting about this tour. I’m nervous. A little apprehensive. Totally excited. And I can’t wait. This is the sort of stuff we live for. Here’s to doing what you love for a living. Nate + Bikes + Guitar = Hey! That’s My Bike Tour. I plan on doing a few more video updates as this tour and the new album (Anchor) become a reality so stay tuned and/or sign up for e-mail updates. It’s been an interesting month. An album was recorded. Concerts were played. Work has been good and busy. And equally so on the home front. Our family has a bit on the urban homesteader bug going around. The hops for homebrewing are starting to climb up the front of the house, the chicken coop is complete and our chickens are moving outside (I will not miss sharing an office with them), and in addition to our regular gardens my wife dug up a section of the berm and we’ve got raspberries started. A theme in all this for me has been focus and limitation. Figuring out the boundaries and working creatively within them. This is what it looks like for me in the areas of Work and Home. I recorded an album with my band Welaware (Micah Taylor – guitar, Justin Rimbo – bass, Graham Peterson – drums). It was the most finite recording session I’ve ever been a part of and equally one of the greatest. I knew our budget and our time frame. We recorded with Michael Morris at the Barn in Northfield MN. His studio is 100% analog. Old school. And we recorded live and almost entirely overdub free. If I screwed up a guitar part we rewound the tape and we all played the song again as opposed to all the cutting and pasting that can happen when recording digitally. I’m not against digital recording – that’s how I’ve worked in the past and will again in the future – but I will say the performances on the new album are inspired and gutsy and real and we owe that to the limitation of tape. Plus, we had a deadline. We could’ve added things to the recording as overdubs – an extra guitar, a shaker, another harmony… but at 4pm we had to leave the studio. What was done was done. The limitations brought an intense and exhausting focus to the sessions that I can’t wait to share with the world. Or at least you. Our desire to be connected with the land as a family living in the city of St. Paul has been interesting. Mostly because of use of space. I love raspberries and berries are an easy fruit to grow yourself but they take up space. And spread by the roots. (There’s a fancy word for that… Oh well.) Last year the city of St. Paul okayed growing tall things on the berm. With the street on one side and sidewalk on the other this provides a wonderful border to contain the raspberries. If we had tons of land we wouldn’t have been forced into this use of space, but because of this limitation we’ve come upon an ideal raspberry growing location. And of course lets not forget those chickens. The city of St. Paul has a permit requirement for chickens which is kind of a hoop jumping exercise but it has allowed us to connect with a few neighbors that we haven’t connected with in the past. So kudo’s to St. Paul for helping us lonely Houges make new friends. In both work and home there are a ton of other limitations that I’ve been embracing that have been leading to stronger focus – including clearing out instruments and getting rid of excess crap in the garage. There is a freedom in having less and working within boundaries that I’m recognizing more and more in my life as life giving and good. Or maybe I’m just overreacting to all the stuffed animals my girls have. It’s possible. Well, actually, Micah Taylor found it. The password. For this site. That I somehow forgot. And as a result have not been bloggity blog blog blogging. I’ve sent a ton of you a link to this blog entry to invite you to promote the concert at Urban Abbey in the Old Market district of Omaha NE on April 19th. It’s going to be a great concert and I’m so grateful that you think so too and that you’re coming and that you’re telling other people about it and that we’re going to pack the house. That makes for a pretty sweet Friday night. Thanks for your help in promoting this event. It’s my first time playing in Omaha and I’m grateful for you support! Hey! We’re in the middle of a great youth gathering here in beautiful, balmy (not), Detroit Lakes area. Or as the locals call it, DL. I will say right now that this is an amazing group of singers – maybe the loudest singers I’ve ever sung with at a High School event. In an effort to get you to keep up the singing wherever you go, and perhaps lead a few songs back in your home congregations, I’ll post the songs we sing as we sing ’em – meaning I’ll keep updating this throughout the weekend. Where There Is Love – Ryan Marsh – You downloaded this by now, right? Where There Is Love – Ryan Marsh – Aren’t you glad you downloaded this? My home congregation, Humble Walk, does not have a full time song leader. It has an artist in residence program. Different artists come in and lead music for a season or handful of weeks at a time. It works and opens us to a wide variety of music. When playing elsewhere it’s often assumed that I lead music a ton at Humble Walk. I don’t. One of the main reasons has to do with me having two kids along with me and there are few things I dislike more than bringing my kids to work. That being said, when I am asked to do it I usually say yes because I love my church and I love leading music and my lovely wife can usually find some extra hands to help out on her end of things to make it tolerable with the kids. So my art was to be baking bread. Which I love. So I said yes. Justin and I met up. The challenge in creating interactive experiences is to find the avenue that allows the unpracticed to participate. The balance necessary in leadership is to provide instruction and structure so that success is measured not in performance (yuck.) but in participation (yeah!) How do you do this with bread? See, that’s why Justin and I had to meet up. Though bread is more forgiving than most (myself included) it’s also weirdly mysterious to the point that it intimidates. Making a loaf of bread takes more time than talent. And somedays I would argue a healthy dose of ‘ignorance is bliss.’ Perhaps bread baking suits me for these qualities. I’m okay with that. connection to the gospel – our songs support the theme, how could bread do that? We first came up with a somewhat elaborate scheme to bring dough in at different stages, including baked loaves. This seemed like the most realistic plan giving our limitations but it also seemed to fit the limitations better than the goal of participation. We wanted to embrace both. What we came up with was tortillas. An unleavened (or chemically leavened – baking powder in this case) bread. The dough would need time to rest but not to rise. 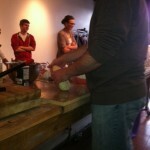 Each person could make his or her own tortilla. We could bake them on a griddle, no need for a kitchen and we could make corn tortillas as well for a gluten free option. And of course there was still a gospel connection to make and pacing through the service. The gospel lesson was about Jesus in the wilderness. Satan challenges him saying, “If you are the son of God turn this stone into bread.” Bread reference. Bam. But so what? There’s a bigger theme I went with. There are proteins in flour that come together to create gluten. You want strong gluten development in bread to create a sort of skin of elasticity that will hold the dough together, and in the case of leavened bread, hold in the CO2 produced by the yeast. It’s what makes bread rise. To form that gluten you need TIME and TENSION. 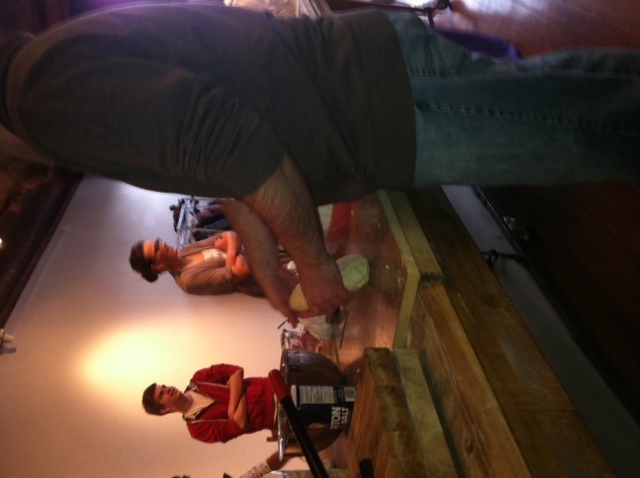 Kneading creates that tension that brings the proteins together. So does time (the key to many no-knead breads). The balance of both offers you workable dough and beautiful flavor. Time: 40 days. Tension: Temptation. Bread baking now reinforced the text and the season. You’ll need a workspace. I used the leftover counter top from where my favorite mother-in-laws sink had been cut out and made two portable workstations, one for flour, one for corn. We made this on a lefse griddle cranked all the way up. It did not work as smooth as the cast iron tortilla pan my Aunt Alice gave me when she taught me how to make tortillas, but it worked. Our ‘opening song’ was making the dough. Two batches of flour, one of corn. The corn tortilla was on the back of the corn flour bag and is way easy, so I’m just going to talk about the flour tortillas here. 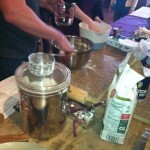 Folks helped measure and knead and everyone had an opportunity to join in and get messy. 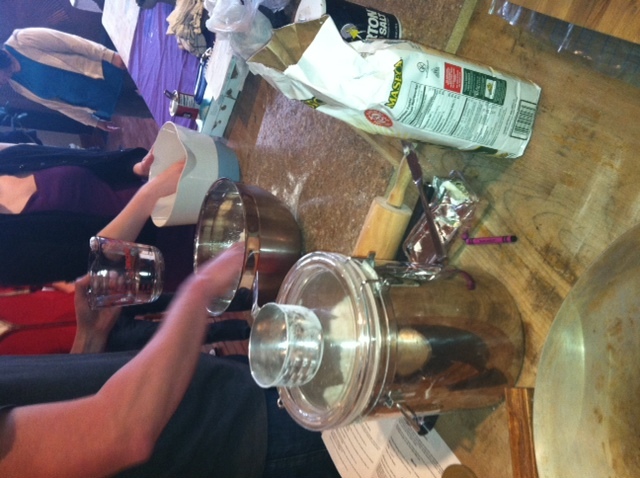 Add warm water and knead with your hands until it is well combined and smooth. A stand mixer will do this at home in about 3 minutes. A slightly sticky dough is good. Super sticky? Bad. Super dry? Bad. So be good and slightly sticky. Divided the first batch of flour dough into 24 pieces and put the pieces in a bowl. Pass the bowl around and each person takes out a piece and rolls it between their hands to form a ball. Then, as ready, come around the alter and roll it out. You can’t roll it to thin. Dust with flour as needed. The corn tortillas we did with a homemade press which went quickly so folks came up and made corn tortillas at the alter. Lay on the griddle till one side bubbles. Flip over for a bit. Little brown dots on each side is coolio. 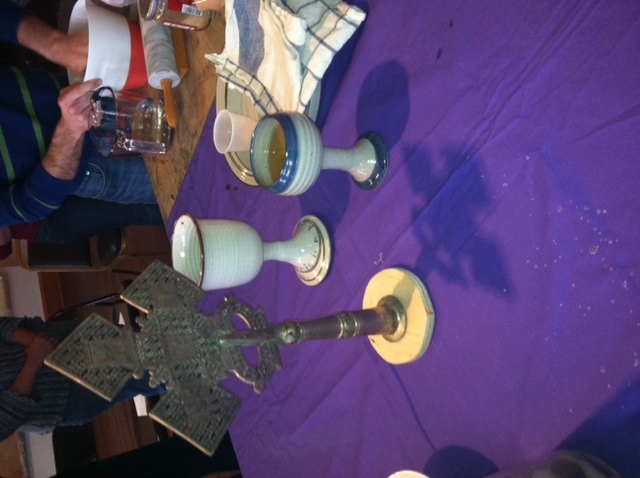 With the scent of tortillas baking we moved into prayer, letting them rise as floured incense. As tortillas were prepared we piled them on to the communion plate (Paten). 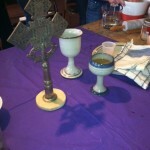 Communion was served by intinction one warm tortilla at a time. I busted out butter, cinammon and sugar as well as plastic wrap and we were sent with something sweet and a few tortillas to take home. Actually, very few… if any. We did a pretty good job of finishing them off. But there was still dough left, so that was wrapped up and sent home with willing spirits that were ready to try something new. And that’s how bread worked as the art of our worship. As is often the case, worship was messy. Fluid. Hiccupy. And beautiful. It was actually more beautiful then I would’ve guessed it to be and for that I thank Justin Rimbo for his vision and my faith community for her support.